All grades of materials from the traditional cold rolled and hot rolled steels to galvanized and tin-plated steels, aluminum, brass, bronze, copper, and stainless steel. 32 tons to 300 tons; The presses handle metal thicknesses from .005 to .500 depending on the part application. Bed size up to 84″ x 50″ with a 10″ stroke with electronic servo feeds. 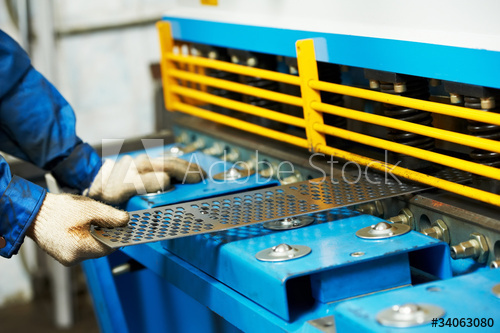 Stampings are generally produced on a single-stage tooling (one hit) or multi-stage tooling (multiple hits in a laid out progression known as a progressive die). Metal is either feed in sheet or coil form, with coil being the most preferred, through the die. The operations that might be included within the die would be blanking, piercing, forming and/or drawing. Any combination of these would be incorporated into the hard tooling to produce a highly precision metal stamping or eyelet. This tooling is dedicated to producing high volumes of one part configuration. Inserts within the same tool are sometimes used to slightly alter the configuration to produce a similar part. Stainless Steel; Cold Rolled Steel; Preplated Metals (such as electro-tin, nickel, and electro-zinc plated steels); Aluminum; Brass; Copper; Monel; Gilding; Bronze; Kovar; Glass Sealing Alloys 42, 52; NiFe 48; And Others. 10 tons to 150 tons; Blank Capacity – 3.65″ maximum; Length: Up to 2″; Wall thickness: from .005″ to .060″; Diameters: from .025″ to .70″ O.D. Eyelets or deep drawn metal forming is similar to progressive die metal stamping. However, the difference is in the first stage of the tool. In the progressive die the part is not separated from the strip until the last operation, whereas in the deep drawn tooling the part material is separated from the strip at the first operation, it is transferred to successive operations with in the die by mechanical devices run by the motion of the press. The deep drawing is popular because of its rapid press cycle times. From a functional standpoint, deep drawn metal forming produces high strength and light weight parts as well as complex geometries unattainable with some other manufacturing processes.